So pretty! I’ve learned to love maple syrup over the last few years. My fiance is from Michigan, and the local maple syrup there is so good, very different from the ones available here in Finland. The frosting looks perfect. These would be wonderful for the Halloween weekend! I’m with you on this. I never liked frosting as a child and thought that meant I didn’t like cake. Until I had good cake with cream cheese frosting together, yum! As long as it’s not too sweet I can handle it, these sound perfect! 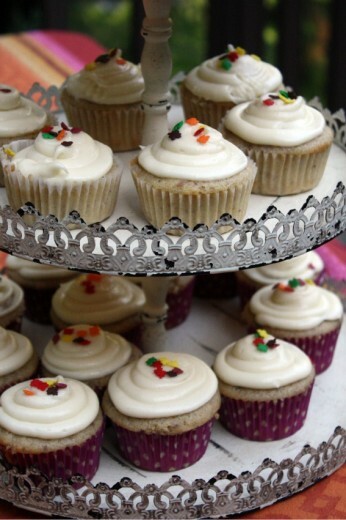 I actually adore cupcakes but not storebought ones…only the ones that I make. I have yet to have a storebought cupcake that I actually think is better than one of mine…not to brag but the ones that are mass produced are usually dry and way too sweet. 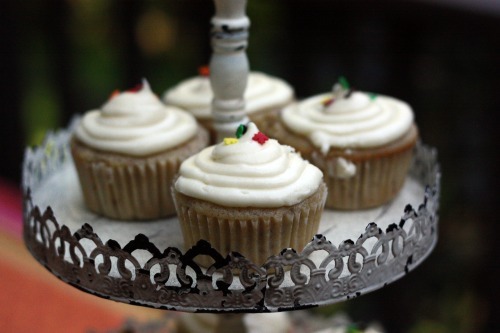 I love anything maple and anything that involves cream cheese frosting. And when you put it in cupcake form…I basically fall in love. I just made some goodalmostgreat cupcakes. So these ones NEED to be the next on my list. They look amazing and from the sounds of it they taste great too…. I can’t wait to try these. I love maple anything. And am in love with his second book. Oooh maple sounds so good. Especially this time of the year! These sound so good! I’m not a big fan of frosting either, unless it’s cream cheese and/or homemade. I had to finally pull the trigger and order Baked Explorations after your Buckeye post and I am so happy I did! These maple cupcakes have been added to my “need to make ASAP” list considering the season…and also my nearly 3 year old nephew now loves cupcakes. My jaw nearly hit the floor when I saw the cupcake picture. Cupcakes?! On Dana Treat?! But you know I’m with you. Homemade cupcakes=good, storebought cupcakes=not so good. These sound fab-u-lous! These cupcakes look yummy! I actually am not a big cupcake fan either (though I make them all the time). But, I do find them to be easier to deal with than a big cake (especially because I don’t have to bother with cutting cake). 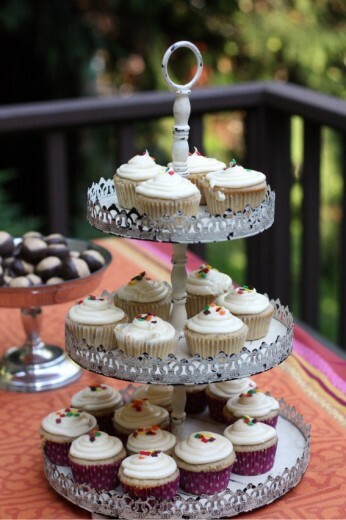 PS – I absolutely LOVE the serving tray/stand that you have the cupcakes on! Ohhh yum. I love anything maple!!! Interesting ingredients! Will have to remember these. I like frosting, but I’m forever after ones that are less sweet, so I’ve tried a few..
Gorgeous cupcakes! I love maple and will definitely have to try these! I know what you mean about some frostings tasting like moist powdered sugar.